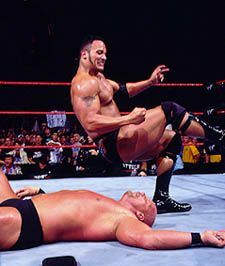 The Rock came back to the WWF yesterday for the first time in 7 years and the most electrifying man in all of entertainment did not disappoint. He called out John Cena, laid the smacketh down on Michael Cole, and most importantly raised the People’s Eyebrow. He even got bleeped out several times. It was a welcome reminder of the good old days of Steve Austin and Mick Foley. Hopefully, today’s wrestlers will be forced to up their game. The Rock will be hosting WrestleMania XXVII and if yesterday’s performance is any indication it is going to be a must-see event.